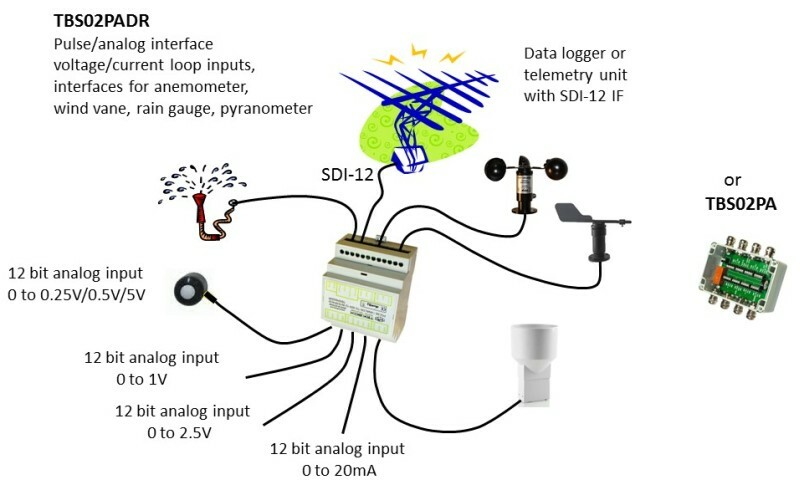 The TBS02PA is a SDI-12 interface board for the connection of a rain gauge, an anemometer and a wind vane. Furthermore it provides 3 general purpose analog inputs with a range of 0-1V, 0-2,5V, 0-5V and a 4…20mA current input. The ADC provides a resolution of 12 Bit. 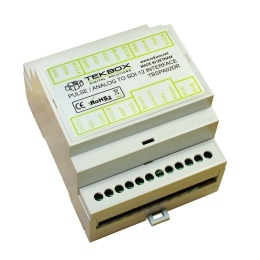 The pulse count inputs are supported by a real time clock circuit, buffered with a super-capacitor. It is capable of holding the time for more than 6 month after the last measurement.The interface board supports both passive and active anemometers with pulse outputs. The 12V supply lines for attached sensors are only switched on during the measurement in order to minimize current consumption. The TBS02PA is available in two housing variants. One variant comes in an off shelf IP67 housing from Fibox. 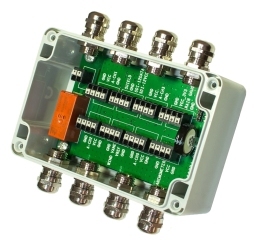 The other variant comes in a DIN Rail housing.